Alinazik kebab, or simply alinazik, is a home-style Turkish dish which is a specialty of the Gaziantep province of Turkey. 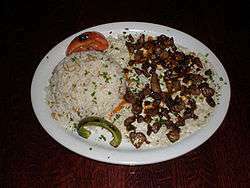 It is made from smoked and spiced eggplant, grilled and then pureed, topped with cubes of sauteed lamb, previously seasoned and marinated. It is usually served with rice pilaf or yogurt with garlic, grilled vegetables, and melted butter. ↑ "alinazik" (in Turkish). Turkish Language Association. 2008. Retrieved 2009-08-14. ↑ Atabay, Banu (2007). Mütevazı Lezzetler Türk ve Dünya Mutfağından Yemek Kitabı (in Turkish). Park Foto. p. 103. ISBN 975-92047-3-8. Retrieved 2009-08-14.